I love corn. I love corn on the cob, cornbread, corn pudding and I certainly love a coarsely ground cornmeal, cooked for at least thirty minutes while liquid is slowly introduced, turning the whole mixture into what is known as polenta. This love of corn is why I get excited anytime I see a recipe that resembles cornbread or calls for some kind of ground corn product. It’s why I turned my mother’s cornbread recipe into madeleines so I could snack on them at tea time, or anytime really. It’s also why these little corn cakes caught my eye in a recent Donna Hay Magazine. They’re quite simple really. 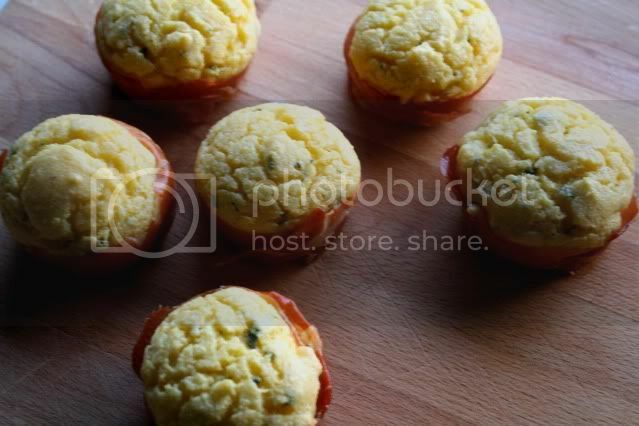 An instant polenta mixture is seasoned with sage and poured into waiting muffin tins lined with prosciutto. The most complicated part of this recipe was locating instant polenta. If you live in Southern California let me save you the trouble of going to the four grocery stores that I visited during my search (yes I said four and yes I am aware that I have possibly the most patient boyfriend a girl could ask for). Gelson’s in Marina del Rey carried the instant variety and I’m willing to bet that their other locations do to. If you can’t find instant polenta, do not try to substitute regular polenta here as it will completely throw off the cooking times. If you don’t feel like putting in the effort to find the instant variety than try what I am going to do next time – whip up a batch of my mother’s cornbread and use it to fill the prosciutto-lined muffin tins. I can’t make any promises about the state of the prosciutto after a longer cooking time, but I love my mother’s recipe so much that I’m willing to give it a try. Place the polenta, flour, baking powder, baking soda, chopped sage, cream and eggs in a bowl and mix well to combine. Season with salt and pepper. 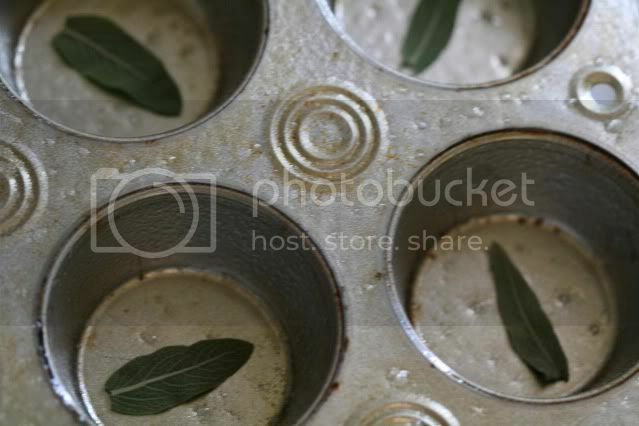 Place extra sage in the bases of 12 lightly greased 1/2 cup capacity muffin tins. Line each tin with prosciutto and fill with polenta mixture. Bake for 15 - 20 minutes or until cooked. Let cool slightly before serving. This is a very clever creation! Lovely idea. I have done the same thing but used a ricotta flavoured with mediterranean ingredients as the filling. Nic pics. Warm from the oven, these look wonderful. The sage and prosciutto...how nice. i must say i'm not crazy about cornbread, each time i tried to give it a chance it was dense and kinda dry, but these look fluffy, and light, and anyway i'll eat pretty much anything wrapped in prosciutto, so i'll have to try these next time i'll have people over. you take lovely pictures. OMG love your blog! I adore all things prosciutto and those are just the coolest looking corn cakes I've ever seen. Your photos rock too:) I signed up to follow your fabulous blog - please come visit me at www.stephaniesavorsthemoment.com. Thanks & look forward to the next installment! Freaking awesome! 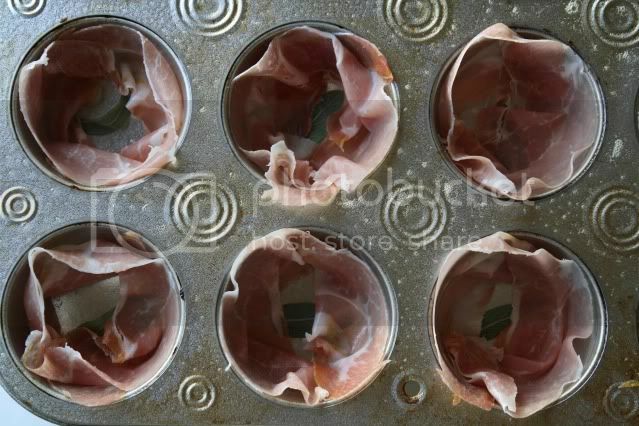 Who needs muffin tin liners when you can use cured ham? Are you kidding? Prosciutto lined corn muffins! Ahhhh, I want those! I know how you feel about all things corn. I love polenta. And prosciutto. I LOVE this idea. I too am a lover of all things corn. What a great accompaniment to something like chili. CORN! *Love* corn and these look so pretty, what a cute pan you have. These are lovely. I have never used polenta, always corn meal to make cornbread. I am going to try this. 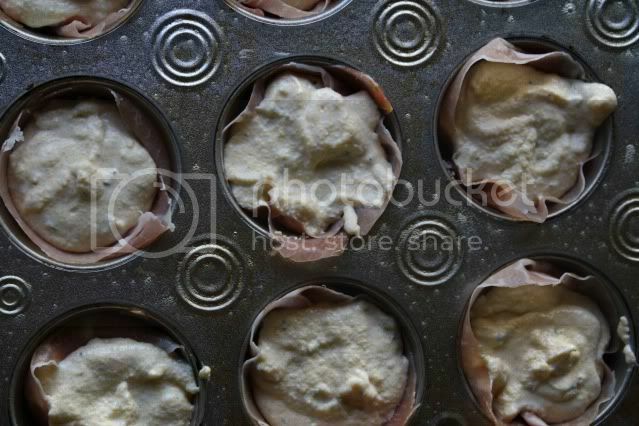 I have a muffin tin that resembles yours. It's the best. They are adorable, all puffed up and golden in their prosciutto embrace. The salty and sweet contrast must be lovely. Gosh I bet those taste real yummy! AND I can eat them! Because the prosciutto is cooked! Praise be! My word verification is "striv" which I can only assume is the lesser know past tense of "strive"? Wow. What a great idea! I would never have thought to do this. These would be a perfect side dish, snack, or lunch. These are adorable, and combine two loves -- salty, cured meat and polenta! What a fun thing to serve at a brunch party! OMG, these are just amazing! what a lovely idea Jessica, neat little parcels to pop into one's mouth...corn & bacon - can't go wrong with that combination. 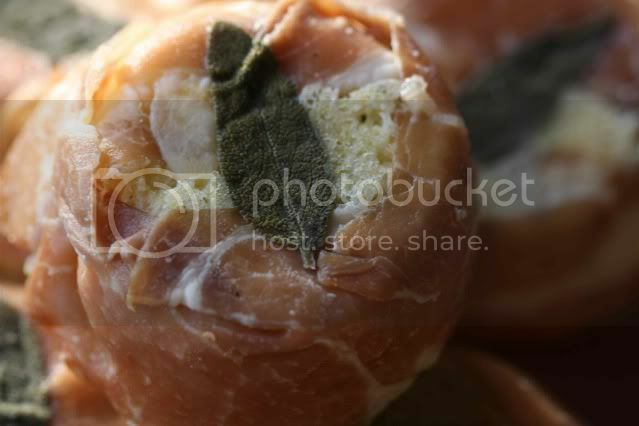 Wow... Prosciutto and sage are two of my favorites. These look amazing!